Last time I was in Edinburgh, I was running up hills. After more than a month now of quite serious foot pain as a result of plantar fasciitis, I’m starting to feel tired of being injured. The night splint I’ve been wearing, albeit uncomfortable, has helped a great deal and meant that my first steps in the morning aren’t painful. However this week we are taking a couple of days of R&R in Edinburgh, splint-less, and I’m struggling. Yesterday afternoon we spent strolling around shops and today walking through the old town and I’m suffering now. I’ve actually spent the last couple of hours lying in the hotel room, foot elevated, eating chocolate, resting up for the evening. I bought my running gear with me, thinking that I could do a few Auld Reekie miles, but that looks unlikely at the moment. I’ll see how I feel in the morning, but my foot is simply too sore just now. We even walked past Run 4 It today, walked past without even crossing the street! I’ve never done that before. The mind is willing, the soul is aching, but the body is weak. It’s depressing, really depressing. I think the time has come to seek out professional help so I’m going to look for a podiatrist. The cost might be more painful than my foot, but ultimately worth it. I don’t think that I can go on like this for much longer. 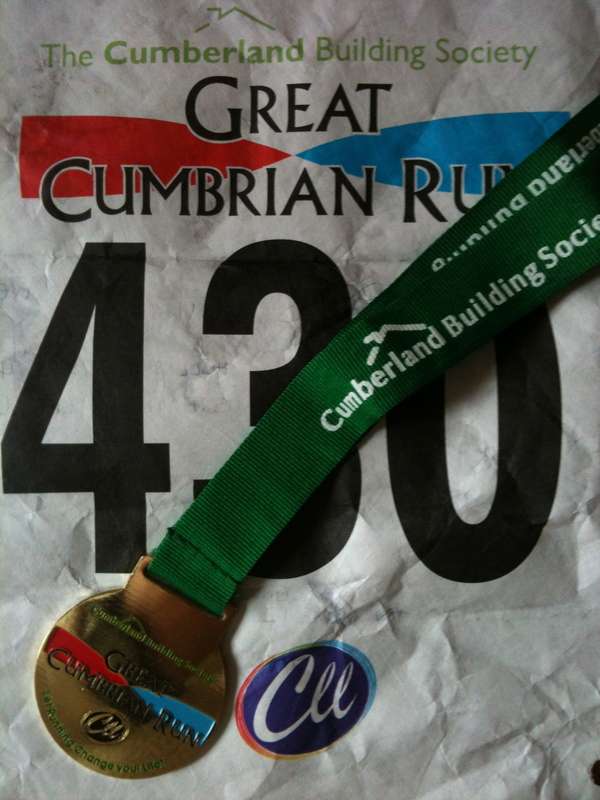 Finishing the Great Cumbrian Run, in almost one piece! Oh my goodness, where do I start? I’ve just completed what was a lovely half marathon route, but only just. 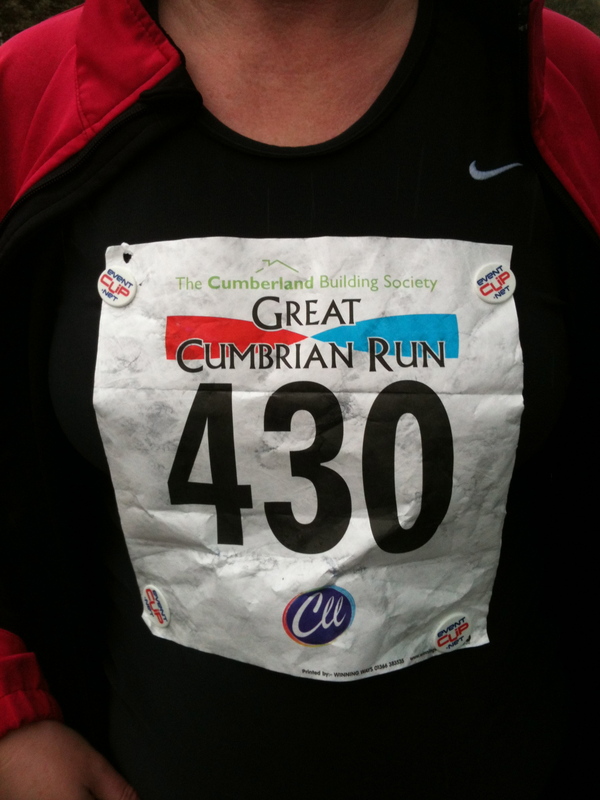 The Great Cumbrian Run is a well attended race, with in excess of 1400 runners, which starts and finishes in Carlisle. 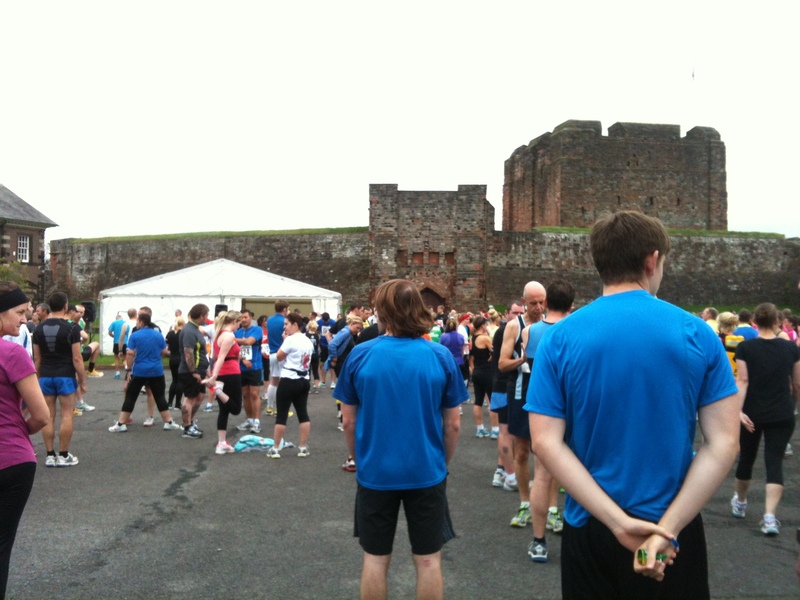 Better than that, you actually get to start from inside Carlisle Castle, run out of the quadrangle, through the castle gates and into the centre of Carlisle city. 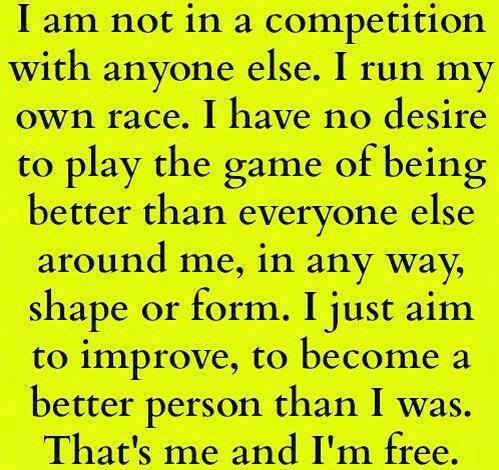 How many races can boast that? We arrived early, worried that we might not be able to park. In reality there was plenty of parking, although we didn’t try to get too close to the start/finish area – something I would come to regret at race finish! I collected my chip, attached that to my shiny Nikes (honestly, who wears WHITE trainers?) and took advantage of the plentiful toilets. At about 15 minutes to the off an official asked all the non-competitors to leave the area so I said goodbye to hubbie and went away to avoid the warm up. 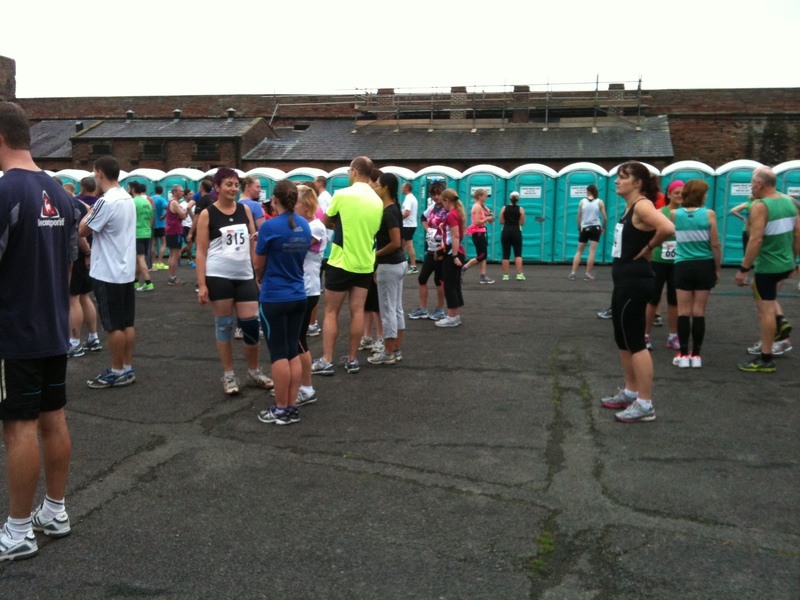 I wasn’t alone – lots of runners stayed well back, doing their own thing. I don’t mind warm up, what I hate are the pre-race stretches everyone is encouraged to make. You can almost hear hamstrings twanging. We started bang on 10. 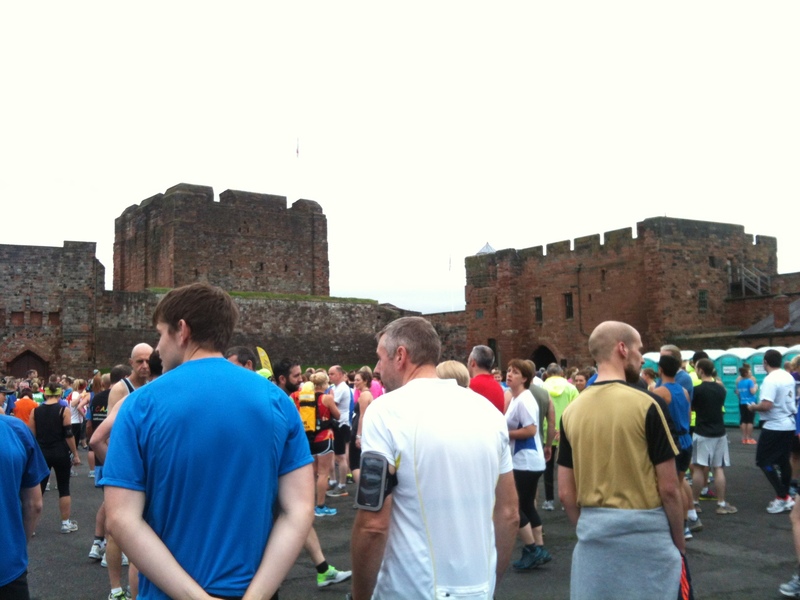 The cathedral bells chimed us across the start line, the spectators cheered us on. We ran straight into the city centre, which was a delight. The route through was barriered off and lined with folk sending us off on our way. I found hubbie at the far end of the pedestrianised area, called and waved and headed off down Botchergate. It was odd running through a city I know well, running past bars and clubs I have frequented on lazier days! I didn’t look too much at my watch. The hills caught my attention more! I had met an ex-pupil at the start who had done the race before and warned me about the hill heading out of town and another at mile 3. I think she left a few out, but those were pretty tough! We climbed up along London Road, heading towards the M6, before turning left and out into the countryside. I hit mile 3 at an encouraging 30:22, but my plantar fasciitis was already making itself known. We passed through the villages of Cumwhitton and Wetheral, both quite well to do areas, supported all the way by locals. I high-fived I can’t remember how many children; it was a bit like the Great North Run in that respect. The hills were hard work with many of us walking up the worst of them. 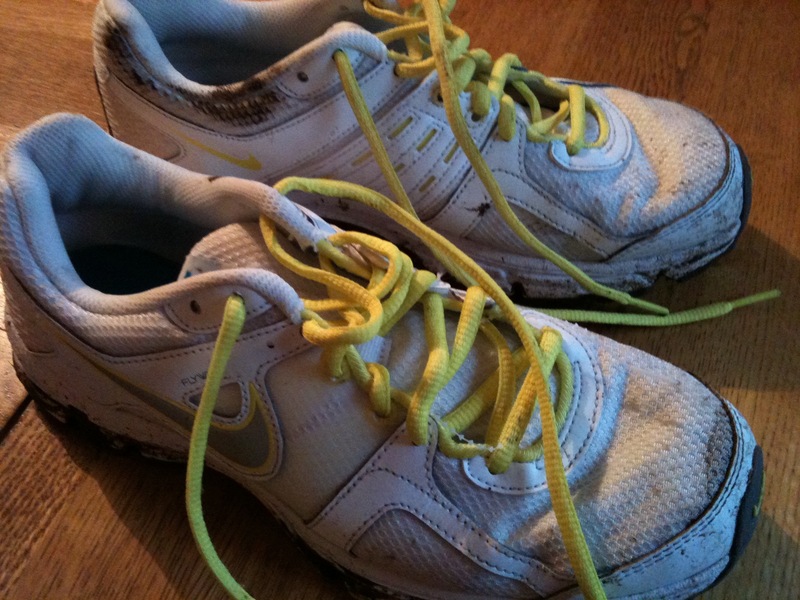 I made 6 miles in 65 minutes – again not bad pace for me, but by then my right IT Band had started to tighten up, a lot. On walk breaks I took to hitting it in order to get the blood flowing, but that worked only briefly. I was fine on the flat and on downhills, but uphill was very hard work! I started to really struggle at mile 7, taking far too many walk breaks for a decent time. My mile times dipped to 12 and 13 minute miles as I began to limp. I felt strong – if my foot and ITB had behaved I think that I might have got a good time, but they didn’t and by mile 9 I was in pain. I met another runner, Emma, who had been running since the beginning of the summer and was running for Ataxia, spurred on by a recent diagnosis of a young girl. We yoyoed a bit as I took walk breaks, but eventually crossed the line more or less together. At a particularly anxious stage of the race for me, at mile 11, when I was in severe pain with both my instep/heel and ITB, she came to my rescue. She ran with me through Rickerby Park, telling me about herself and then asking me about myself until we reached a hill that I just couldn’t run up. I took a walk break, but caught her up a bit further on. When she started to falter at mile 12 I took her hand and we ran together for a while until she felt better. This is the first time I’ve experienced this and without Emma’s help I might not have finished at all, despite my own determination. I needed an angel. My app stopped short of the finish, about a mile short. I restarted it so that I could benefit from greatly needed walk breaks, but ended up just running when I could. As I ran through Bitts Park I kept Emma in my sights and just kept going. I saw hubbie as I rounded the corner into Sheepmount Stadium. I thought that I had a lap of the course to do, but it was only half a lap. I ran as fast as I could through the line, but by the end I was completely spent. I couldn’t lift my leg onto the bucket for the chip to be removed, the pain in my leg was that bad. I could hardly move, but saw hubbie just beyond the finish area. I started to see stars and realised that this meant that I was about to pass out. I hadn’t noticed that my breathing had become rapid, shallow, raspy gasps and that I was running out of air. We made it to some seats and I took my asthma inhaler, starting to feel better within a few minutes. It was scary, but passed quickly. 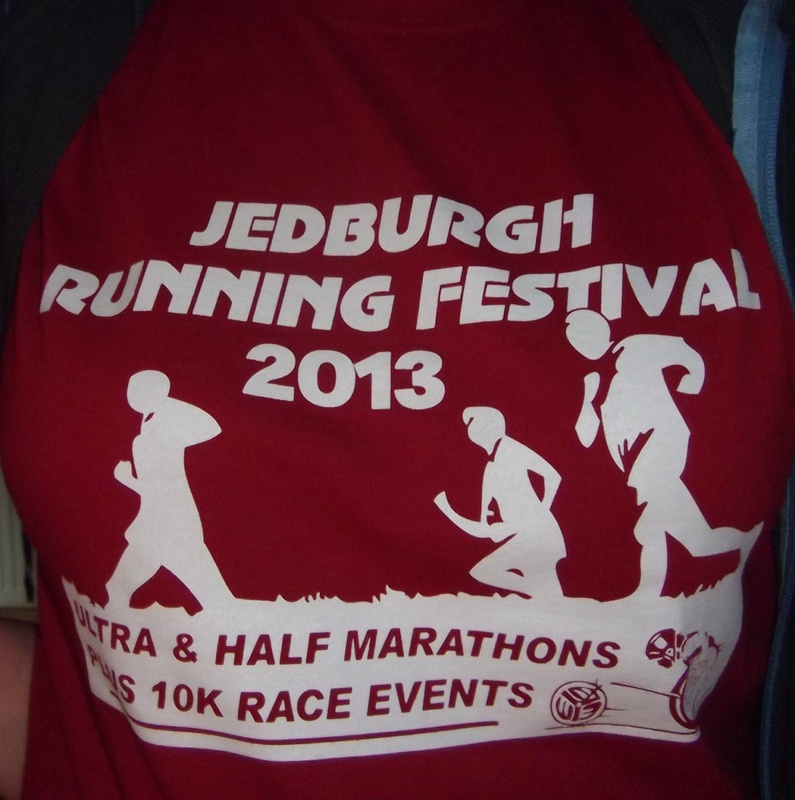 The bling was very nice and I also got a T shirt which, in time honoured fashion, I am wearing! The walk back to the car was complete murder. Having parked at the other end of Bitts Park we had to walk for about 10 minutes. OMG. My foot ached, my ITB was taut and my hips were sore. I was a total mess! However, after a quick change of clothes, a soya milkshake and a Nature Valley bar I felt better. Having been home for a few hours now I have bathed, applied Deep Freeze to my legs and sat for the Grand Prix with my foot on an ice pack. I’m starting to feel slightly hungry and slightly more human. I will sleep tonight. In fact, I might not make it to tonight! Special mention has to go to EventClip, whose fab clips held my number in place, didn’t spoil my vest and looked pretty cool. I saw one other runner using them as well! What next then? 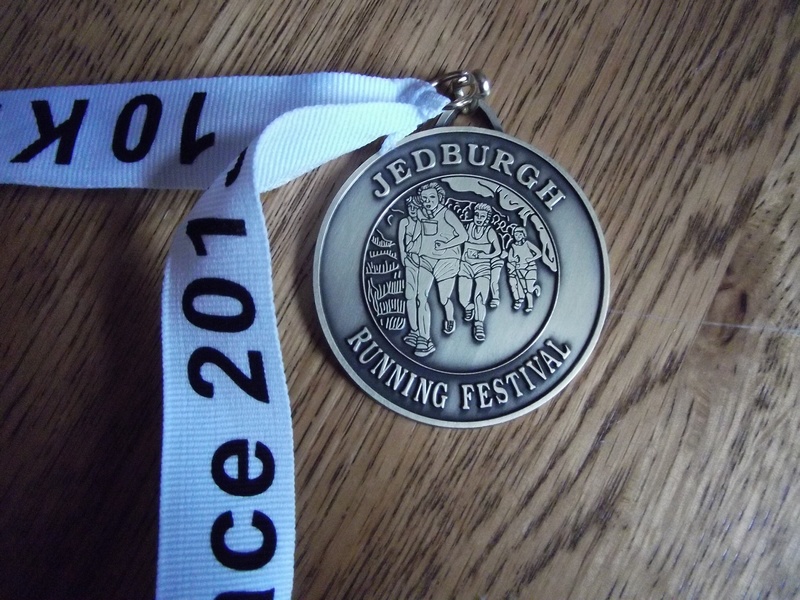 Well I am booked in to do the Jedburgh 10k at the end of October. Hopefully my foot will heal in time for that. I’m now considering buying a night splint to stretch my foot – hell, I’ve tried everything else! My next run will be a short recovery run once my foot feels better!